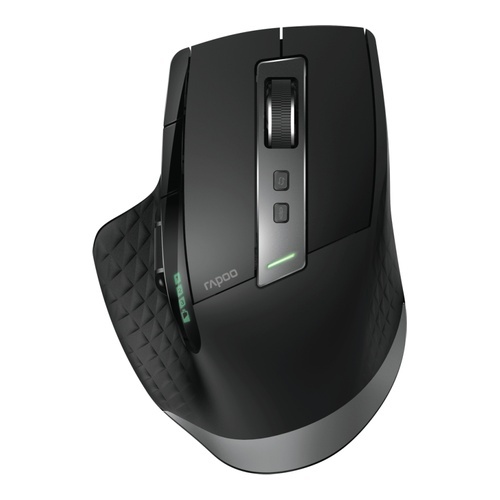 This advanced wireless mouse offers superior comfort and functionality in an elegant beautiful design. The main feature of multi-mode wireless connection - via Rapoo’s reliable 2.4 GHz wireless transmission, Bluetooth 3.0 or Bluetooth 4.0. (Smart) - allows you to connect simultaneously to up to 4 devices and change (pair automatically) among them. With MT750S precise navigation on virtually every surface is possible thanks to the high-performance laser engine and fully adjustable 3200 DPI. To make it even better, MT750S features a rechargeable battery so you can enjoy wireless freedom without having to replace batteries. This advanced wireless mouse offers superior comfort and functionality in an elegant beautiful design. The main feature of multi-mode wireless connection - via Rapoo’s reliable 2.4 GHz wireless transmission, Bluetooth 3.0 or Bluetooth 4.0. (Smart) - allows you to connect simultaneously to up to 4 devices and change (pair automatically) among them.